John Constable (1776–1837), Hadleigh Castle, The Mouth of the Thames - Morning after a Stormy Night (detail) (1829), oil on canvas, 121.9 x 164.5 cm, Yale Center for British Art, New Haven, CT. Wikimedia Commons. These days, particularly in comparison with his rival JMW Turner, John Constable’s paintings may look rather staid and traditional. But in many respects, Constable was every bit as radical as Turner, and this article looks at his depictions of figures, particularly in the many studies which he painted. Constable was unusually helpful to us in leaving not only a great many of the studies and sketches which he made for his finished paintings, but also explaining how he approached composition and his attitude to ‘truth’ in painting. Although he had a realist style, and his finished paintings give the illusion of being faithful and detailed representations of what he saw in front of him, that was not the case. He may have painted en plein air, in front of his motif, when working up studies for a finished painting, but he did not intend to make images exactly like what he saw in front of him. Instead, he recomposed and adjusted his mental image according to his aesthetics, and painted something which was similar to reality, but not identical – he captured its essence, rather than copying it slavishly. Trees, churches, and other elements in the landscape were all mobile and modifiable as he saw fit. If you have ever visited the areas in which many of Constable’s most famous paintings were made, in Suffolk, England, you will have seen how well he captured the spirit of what he saw, although the details were often changed quite substantially. Like his better-travelled contemporary Thomas Fearnley, Constable painted figures and other details in many of his sketches and studies. 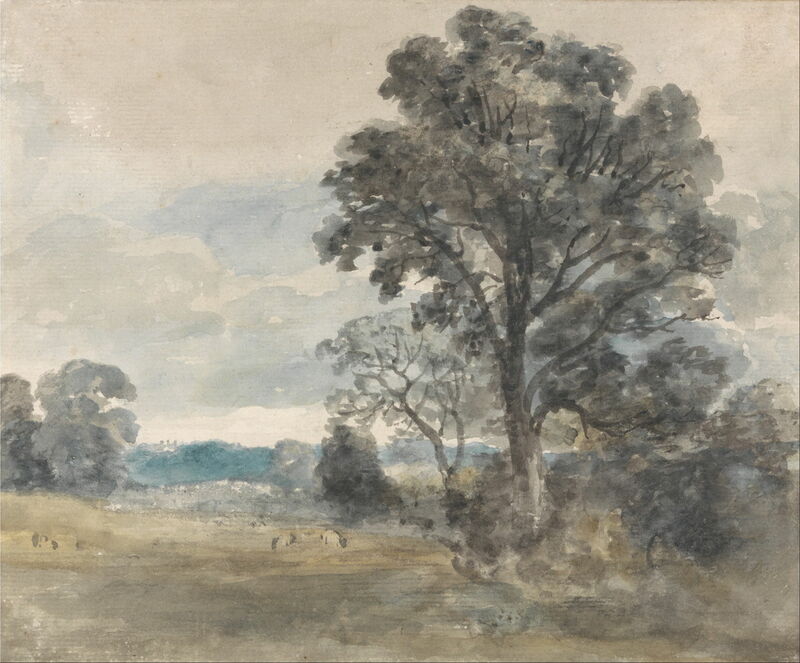 In this watercolour of Landscape at East Bergholt (c 1805), there are small blobs representing cattle in the field on the left. Constable’s oil sketches are amazingly ‘modern’ in appearance, and still contain individual figures in among the squiggles and blobs of paint, in this case making up his sketch of Fen Lane, East Bergholt (c 1811). 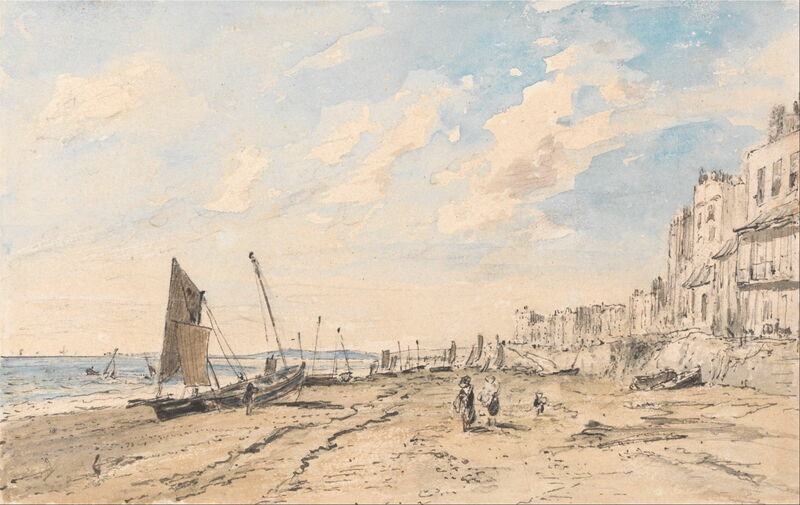 John Constable (1776–1837), Brighton Beach Looking West (date not known), graphite, pen and black ink and watercolor on medium, slightly textured, cream wove paper, 11.4 x 18.1 cm, Yale Center for British Art, New Haven, CT. Wikimedia Commons. This undated ink and watercolour sketch of Brighton Beach Looking West is thoroughly gestural, as shown in the detail below of the closest figures. 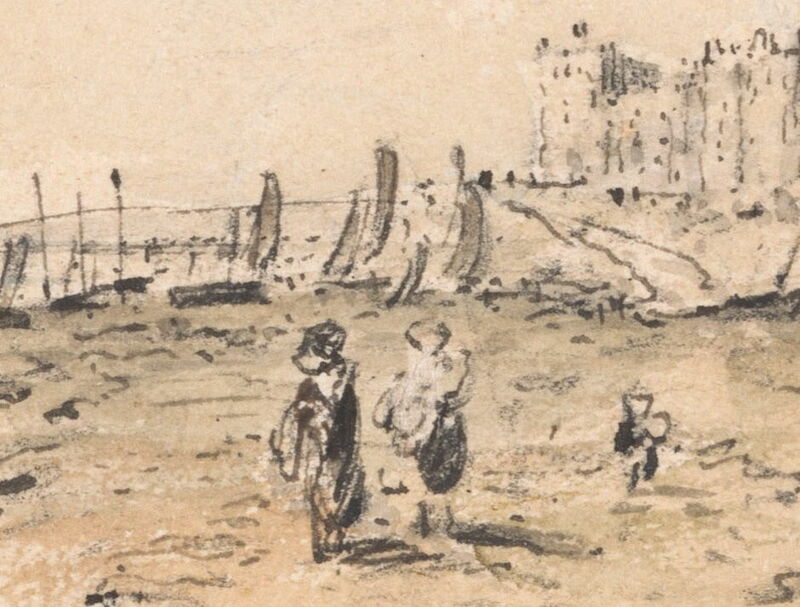 John Constable (1776–1837), Brighton Beach Looking West (detail) (date not known), graphite, pen and black ink and watercolor on medium, slightly textured, cream wove paper, 11.4 x 18.1 cm, Yale Center for British Art, New Haven, CT. Wikimedia Commons. 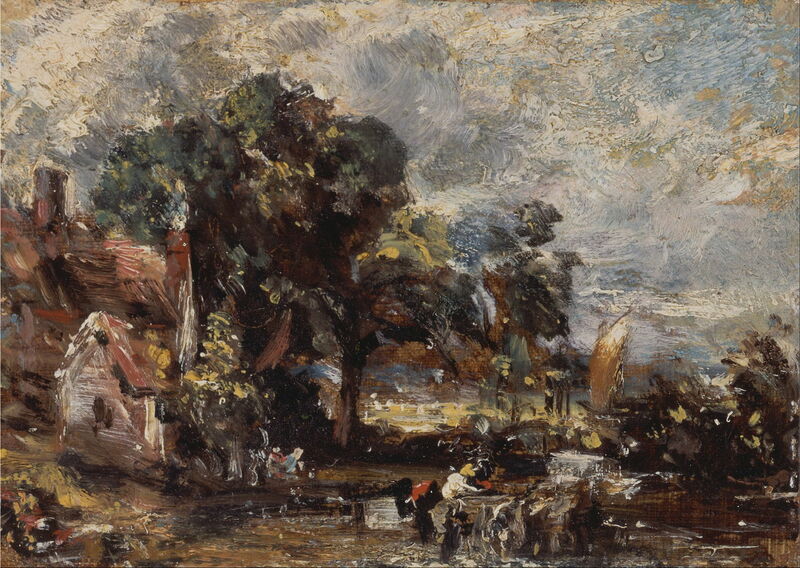 John Constable (1776–1837), Dedham Lock (1819-20), oil on paper laid on canvas, 22.2 x 27.3 cm, Yale Center for British Art, New Haven, CT. Wikimedia Commons. Dedham Lock (1819-20) appears to have been sketched in great haste, but as usual Constable took those extra minutes to add some marks indicating his disposition of figures, most prominently the lock-keeper, who is shown in detail below. 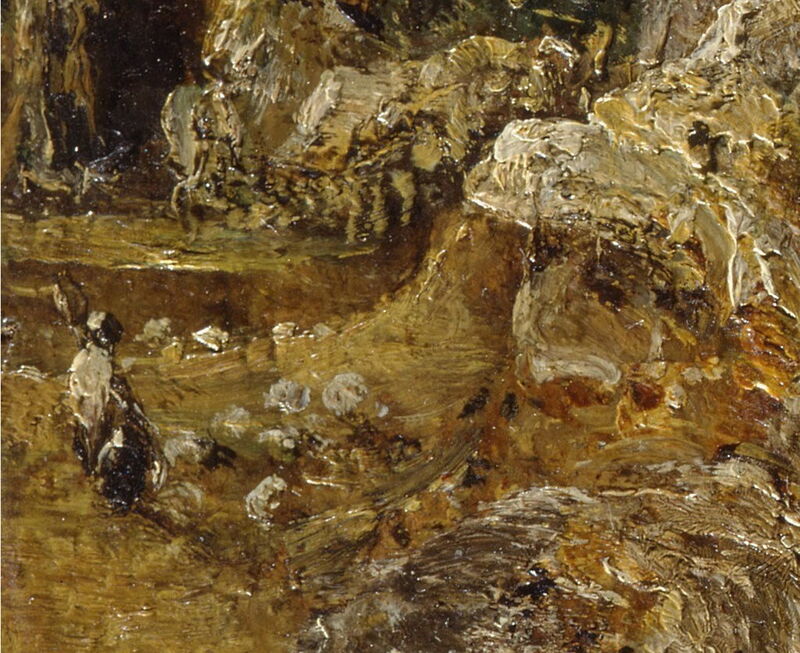 Looked at closely, what Constable painted was not even a representation of a human form. It is almost a place-marker suggesting some of the colours which might be applied more carefully as his ideas and mental image started to coalesce. John Constable (1776–1837), Dedham Lock (detail) (1819-20), oil on paper laid on canvas, 22.2 x 27.3 cm, Yale Center for British Art, New Haven, CT. Wikimedia Commons. 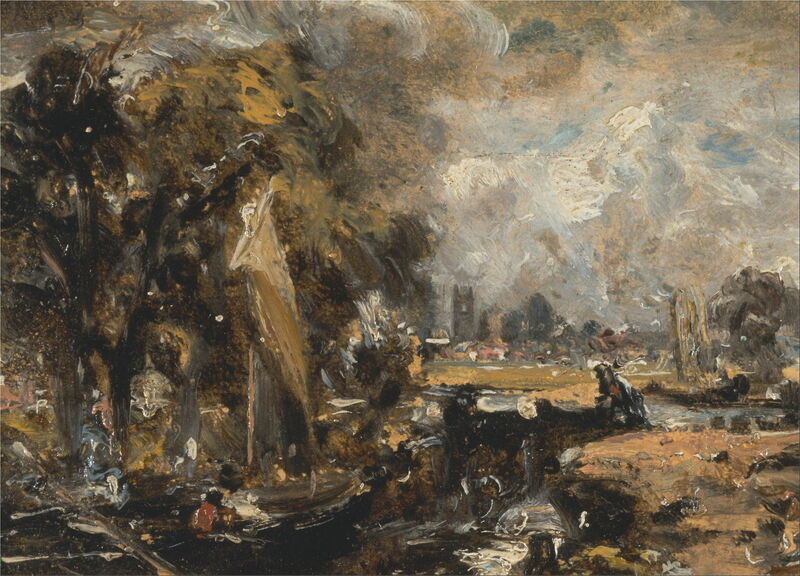 John Constable (1776–1837), Sketch for “The Haywain” (c 1820), oil on canvas laid to paper, 12.4 x 17.8 cm, Yale Center for British Art, New Haven, CT. Wikimedia Commons. This early sketch for Constable’s most famous work The Haywain (c 1820) is as rich in figures, and the wagon itself, as the finished painting. The detail of the haywain (below) would have appeared quite progressive 250 years later, although the artist clearly spent some time forming it and giving it colour. 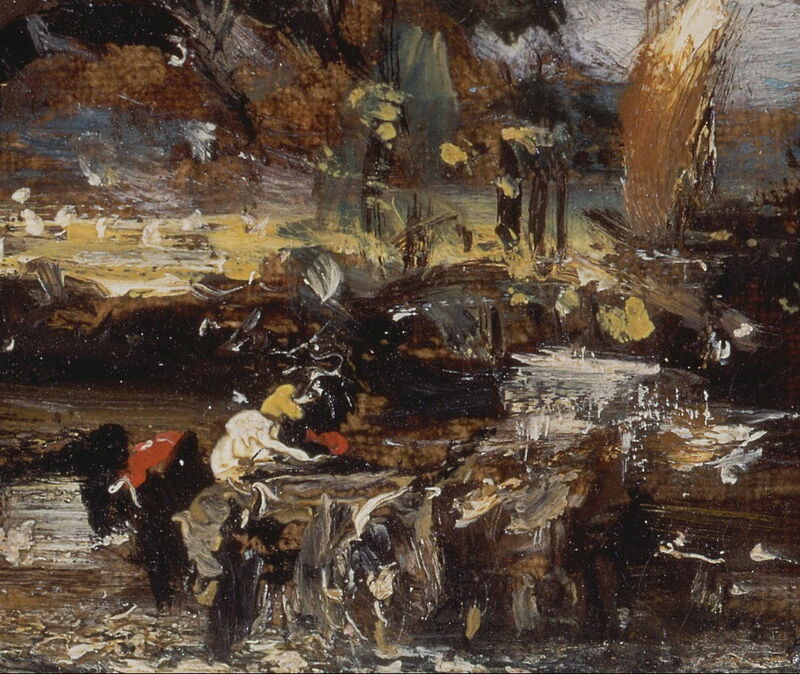 John Constable (1776–1837), Sketch for “The Haywain” (detail) (c 1820), oil on canvas laid to paper, 12.4 x 17.8 cm, Yale Center for British Art, New Haven, CT. Wikimedia Commons. 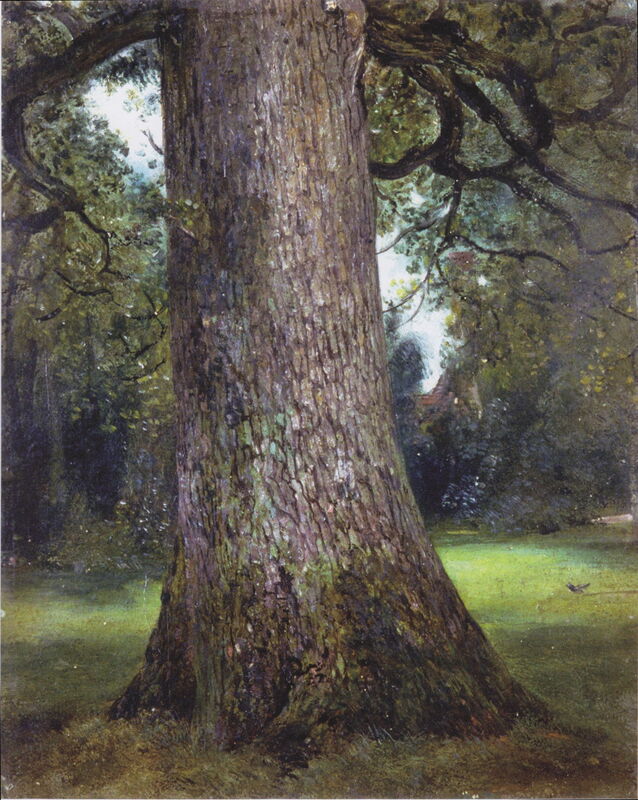 This superb Study of the Trunk of an Elm Tree (c 1821), with great detail in its bark and lichens, could not have looked complete to Constable without a single magpie on the grass. In this sketch of Harnham Gate, Salisbury (1820-21), Constable felt it necessary to include at least five human figures, including two who are on the far side of the gate and barely visible. As his paintings matured towards their finished state, so their figures became less gestural, and more highly detailed. 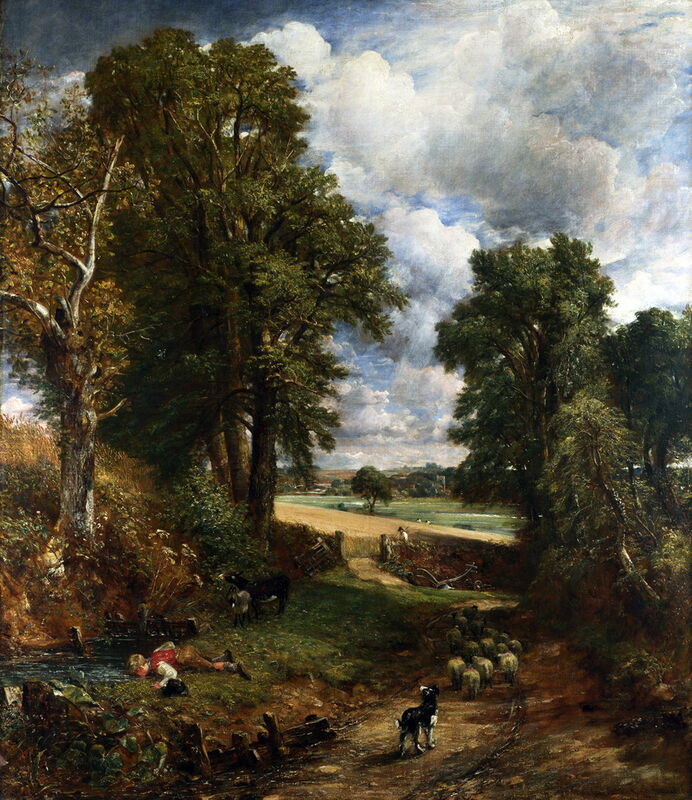 In this view of The Cornfield (1826), a boy shepherding the small flock of sheep has paused to drink from a pond. 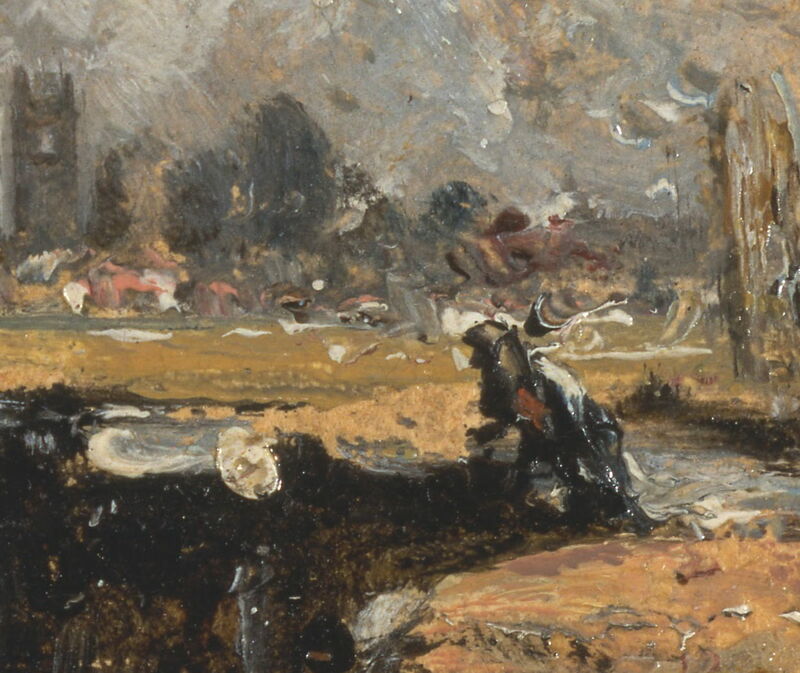 The figures draw the viewer’s gaze into the cornfield, then on to two people in the distance, silhouetted against the water-meadow in the background. 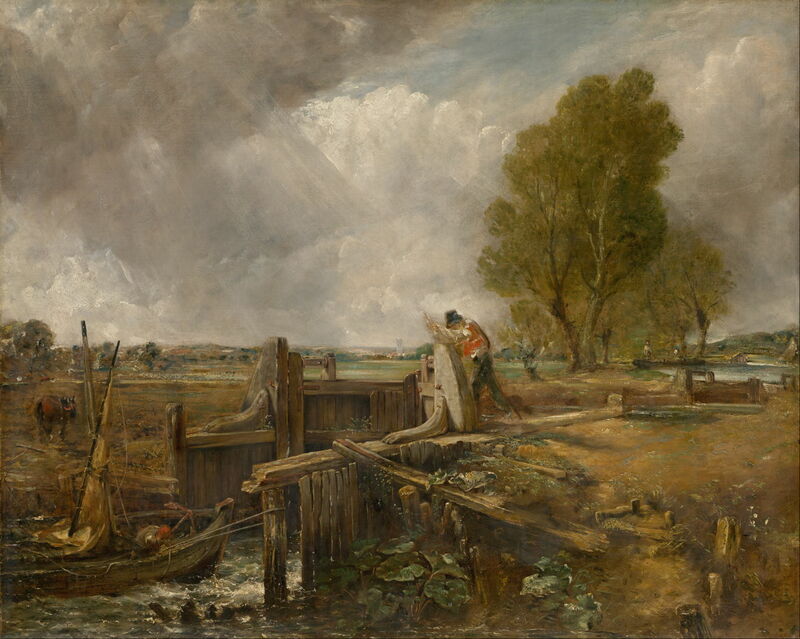 John Constable (1776–1837), Study of “A boat passing a lock” (c 1823-26), oil on canvas, 102.2 × 128 cm, National Gallery of Victoria, Melbourne, Victoria, Australia. Wikimedia Commons. This advanced study of A Boat Passing a Lock (c 1823-26) makes its figures work: the lock-keeper is working his lock, readying it for the small sailing boat to enter. 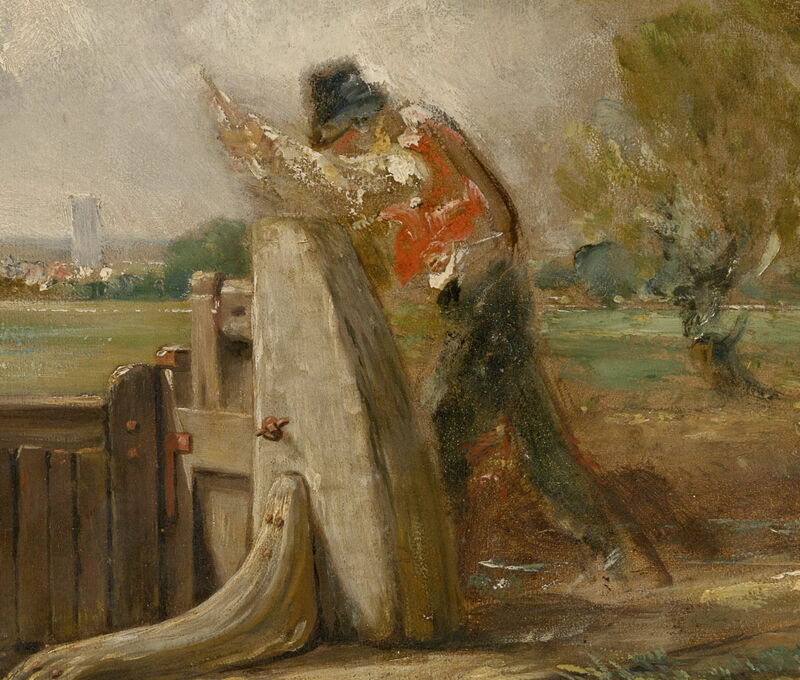 As seen in the detail below, Constable has taken more time and care to paint the lock-keeper here, although the fittings on the lock are depicted with greater precision. John Constable (1776–1837), Study of “A boat passing a lock” (detail) (c 1823-26), oil on canvas, 102.2 × 128 cm, National Gallery of Victoria, Melbourne, Victoria, Australia. Wikimedia Commons. 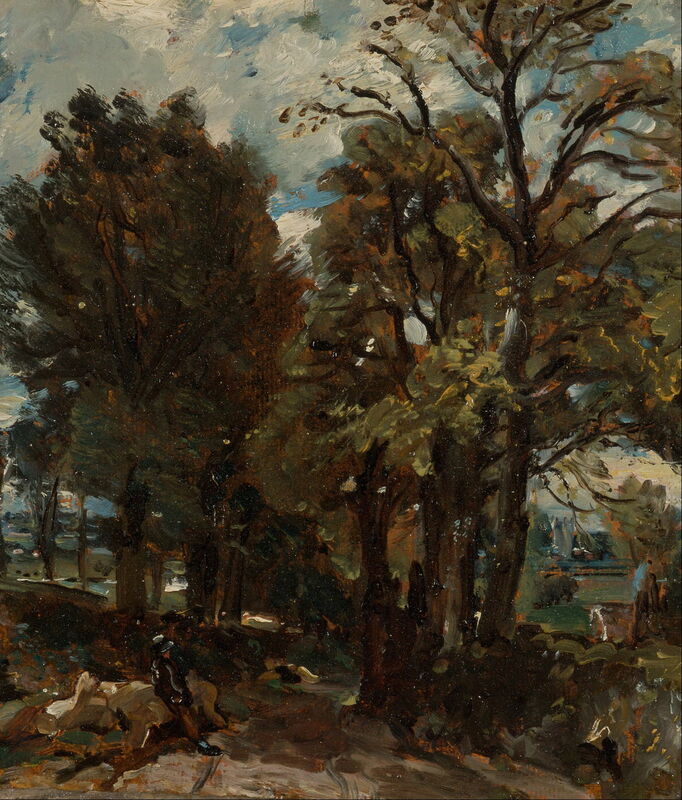 When Constable reaches his finished paintings, those rough squiggles and blobs are replaced by figures as carefully detailed as the branches and leaves in the trees. They are seldom more than minor compositional aids, though. The clerical couple just beyond the gate at the left are reminding us to look at the cathedral, as if we wouldn’t. The cattle remind us that this is a water-meadow, almost open countryside, and still actively grazed. 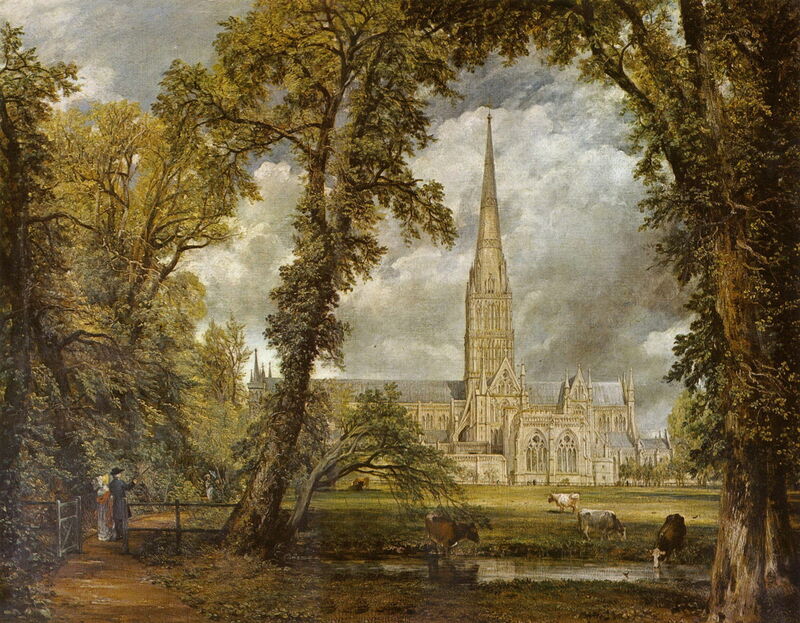 In this different view of Salisbury Cathedral from the Meadows (1831), the staffage is threatening to overwhelm the foreground. There’s a large wagon drawn by three horses, which is slowly making its way through the river, as shown in the broken water. Behind that, a fisherman, perhaps, has stepped out of his boat into the reeds. A black dog on the bank just in front of the viewer is watching the scene, and at the far left there’s a man wearing red and a cow down in the water. At their best, Constable’s canvases are less cluttered, and his figures of greater value. 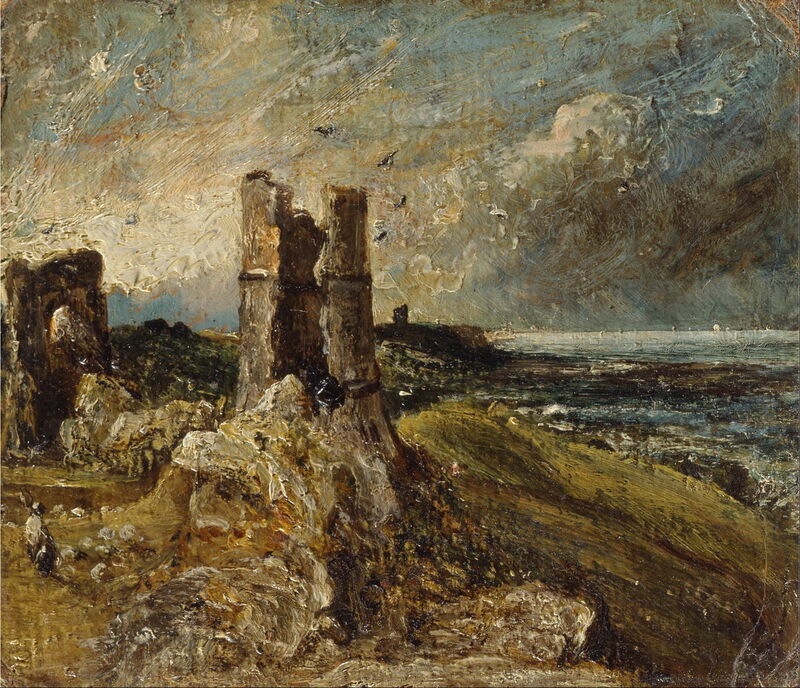 John Constable (1776–1837), Hadleigh Castle (sketch) (1828-29), oil on millboard, 20 × 24 cm, Yale Center for British Art, New Haven, CT. Wikimedia Commons. This early sketch of Hadleigh Castle (1828-29) already contains some surprisingly detailed passages: at the far left, a shepherd, his black dog by his side, with a small flock of sheep, which are grazing near the ruined tower (shown in the detail below). There’s a brown and white blob on the seaward slope, probably a cow grazing there. Wheeling in wrinkles of impasto above the tower are a few birds, which resemble small runnels of liquid metal like solder. John Constable (1776–1837), Hadleigh Castle (detail) (sketch) (1828-29), oil on millboard, 20 × 24 cm, Yale Center for British Art, New Haven, CT. Wikimedia Commons. 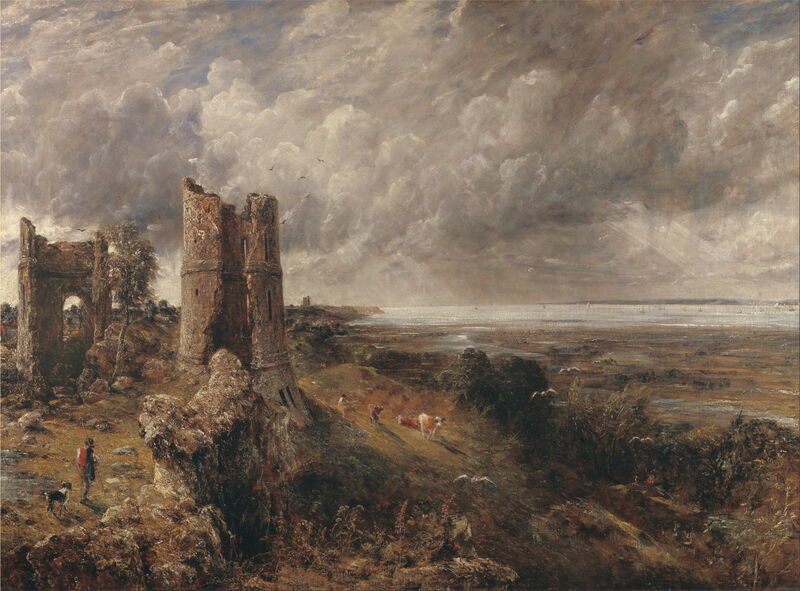 By the finished work, the splendid Hadleigh Castle, The Mouth of the Thames – Morning after a Stormy Night (1829), the basic disposition of those figures has changed little, but Constable has changed each to suit his image. 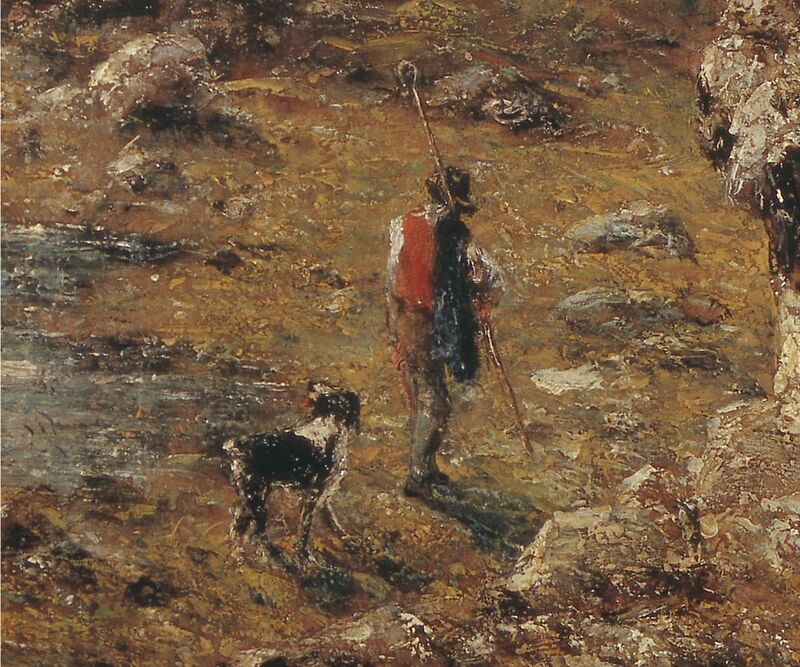 The shepherd, still carrying his long crook, is separated from his dog, and has lost his sheep, which have become scattered rocks (detail, below). The single cow on the sloping grass has gained a couple of friends, and a cowherd. Beyond them are another couple of tiny specks of figures, and there are more by the wood in the lower right corner. John Constable (1776–1837), Hadleigh Castle, The Mouth of the Thames – Morning after a Stormy Night (detail) (1829), oil on canvas, 121.9 x 164.5 cm, Yale Center for British Art, New Haven, CT. Wikimedia Commons. At last Constable’s facture has become more painterly, his brushwork more gestural and more like his sketches. 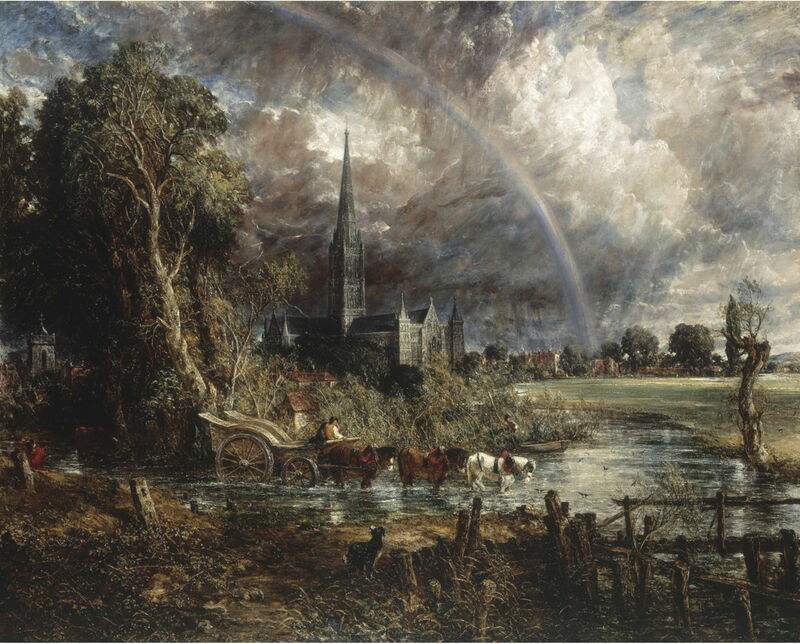 The question, of course, is whether Constable’s figures were really there when he painted them. In each of those amazing sketches, were the people and animals present at the time? Did he adjust their placement, perhaps? We’ll never known, but I don’t think that it’s important anyway. 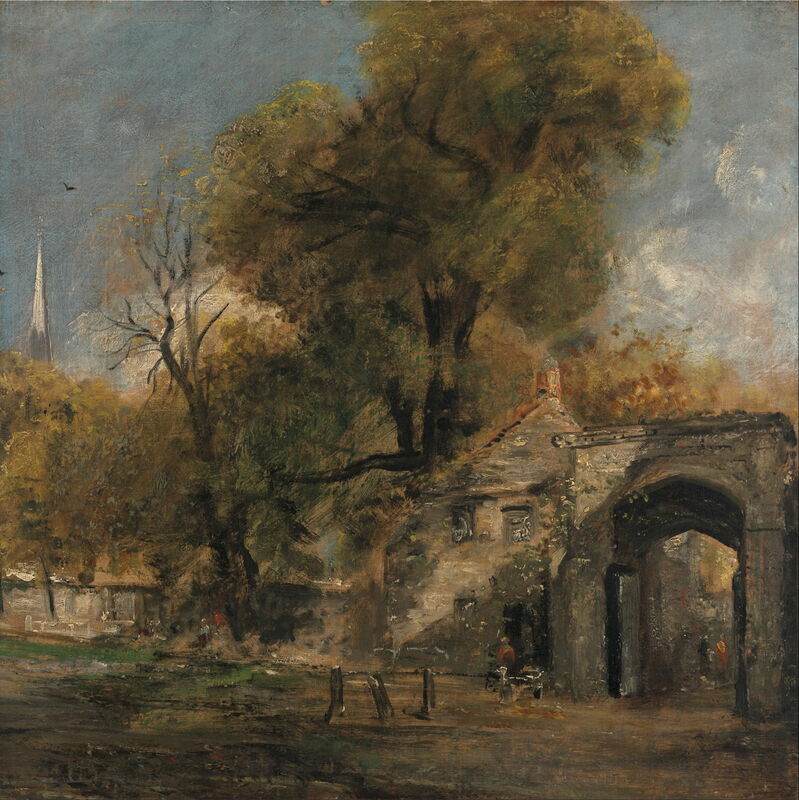 They were clearly present in Constable’s mind, and that is what he reveals in his paintings. Posted in General, Painting and tagged Constable, figures, gesture, landscape, mark-making, painting, sketch, staffage. Bookmark the permalink.